This app is the business. I use this app everyday to get streaming RSS feeds on market news involving domestic and international activities. Well designed for iPhone and iPad. I only recommend one thing, the iPad version should have dual column RSS feeds as an option - sort of like tweet deck. Good app. Only a few wants. This is the only RSS news app I've found that gets it done on both OS X and IOS platforms. Check out Thea's app: as slick as this one. Only two wants: story post time should reflect actual age of story IMHO, not time story was DL'd. Also, an app icon badge reflecting new stories available would be great, however this might require excess battery power to keep tabs. Some RSS apps I've used can do this. With no noticeable drain. Broken in iOS7. No customer support. Like many, I purchased this app and the related Mac app when Google reader went away. I had a question pre iOS7, and emailed support for this app. I never heard back from them. And now, as many have reported, it is broken in iOS7 and unusable. I hope an update comes out soon. In the mean time, they still never answered my support question and I am actively looking for another app to replace this one. The Good: imports your Google Reader Takeout file easily. Not so good: I think I'm spoiled -- I just expect "Readability" style formatting. So when this app shows me the actual web page with all its ads and junky formatting, I want to run screaming. So I can't say that this makes it a bad app, it's just not what I was expecting. This is updated daily! I love it! I love the easy to use, minimal interface. I also really like that it syncs with the NewsBar app on my Mac! Like others i needed find replacement for google reader and settled on newsbar. I picked up both mac and ios versions and icloud sync works well. I find myself using ios version as i like to see sites in list form. Response of the app is very good and gestures work as they should. Gave app 4 stars for two reasons. First is i find myself having to kill the app from time to time and relaunching to see which sites have unread articles. Second is no way to reorder which is frustrating when adding a new site and things are not sorted alphabetically. Making the adjustment on mac app and syncing back is my work around. Would like to see in future update the ability to determine how often feeds are refreshed even if its at expense of battery life. For a new rss reader this is a highly polished app. Do not hesitate on the price it is worth your money. I love how it syncs with the Mac version and it feels seamless. Can't add new feeds via "+", Safari, or import OPML (xml). Using "+" causes app to crash. Waste of $2.99. 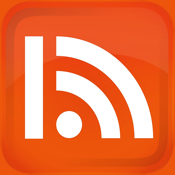 This used to be my favorite rss reader. The recent update, however, introduced a bevy of bugs, from display/formatting issues to frequent crashes (brought about by something as simple as changing a setting or tapping a headline). Really disappointed. Feedly app is looking pretty good at this point, and gives me everything I need. The iCloud integration is the strong point of NewsBar. I use Mac, iPhone, and iPad. After Google Reader went away, NewsBar was (and is) the right answer for me because it lets me sync the newsfeeds on my devices using a service I already have. The synch with iCloud is great but the look and feel is kind of poor. My iCloud sync has stopped working, rendering the product's main feature useless. I just hope it gets fixed soon. I absolutely love this RSS reader but, for me, the lack of Pocket support forces me to withhold the 5 star rating. I’m sure they will add it with an update soon. Then I will revise my review. This is a fantastic app! I highly recommend it. Just seeing a small bug - quite a few crashes after the last update when tapping to open the full article. Stop asking for a rating! It's annoying. No accounts needed, syncs with iCloud, and has a wonderful desktop equivalent. I love this app. I had bought this specifically for the notification feature and it does not work. Great app that looks great and the support is top of the line! Not a bad app, but for now I'm continuing to use Reeder. This app is very very well designed, and I am a bit picky when it comes to apps. Very intuitive and great features and clean layout that makes it easy and pleasurable to scroll through the news. Wonderful job ladies and gents. iCloud sync works well and app looks good. But won't use this app without one-touch sending to Pocket. Hope you can add that devs. Sir Crashes A lot ! I really like this app but....it's constantly crashing! I have the first IPad mini running iOS 7. I have read there are many problems with apps crashing with ios7. A fix gets it to five stars. Love the iCloud sync feature. The Mac edition works great but iPhone app still needs work. Notifications missing and sharing options need work. The update was stated to add Notification Center support, but I have seen no evidence of that. Newsbar cannot be found in the Notification settings and I have received none despite having keywords set up. Despite the fallacious claim, the app is excellent overall. Current version has trouble displaying the headline and preview while in portrait mode. It is scrunched up on top itself as though it is in a landscape mode, but is unreadable.. 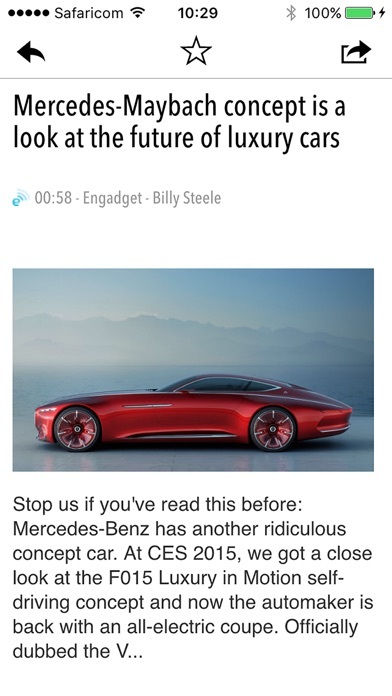 The primary issue I have that prevents me from awarding 5 stars is that when you are reading an article and scrolling it, you (I) naturally want to move the content near the top of the screen and with NewsBar, it jumps to the next article the moment the last bit of content appears at the bottom of the preview screen. You simply can't scroll the last bit of content to the top of the window. This makes no sense to me. I can think of no use case where someone is going to read every single article in their feed one after the other (in reverse historical order no less). People scroll not to move on to the next article, they scroll to see more of the article they are reading at a place that is comfortable for their eyes. Even when I scroll back to the article I was trying to read, 8 times out of 10, I still try to scroll it and end up skipping to the next article AGAIN. It's very frustrating. I bought this and the desktop app purely and only for the iCloud sync feature. I need a way to keep my rss feeds the same on mac and iOS, as well as mark as read the same on both. The GUI is not so great, and the syncing can lag a little at times, but because it does sync without requiring some aggregation service, it's a winner for me. Needs iPhone 6 Plus support!!! You would think I could setup instant notifications for an RSS reader but no. Also crashes regularly. Needs help. I love this app. Great app on the iPhone and I love that there is a companion app on my MacBook. The syncing both apps together is a great feature. This biggest impression this app leaves on one is that it is balky, scrolling stalls often, after clicking on a story within an individual feed's listing, it oftens fail to load without clicking on another story first, then again on that story. Unlike many other iOS RSS readers, tweeting from the title listing (w summary) that appears on the right after tapping on the listed story results in an "empty" tweet. Issues. Have this for both iOS and OS X and it is a great, non-intrusive RSS manager. Only gripe? It takes up an inexplicable 1.2G of iCloud storage. Whaaaa'? Use on Mac, tablet and phone. Still miss Google Reader, but this is an arguably more human approach. 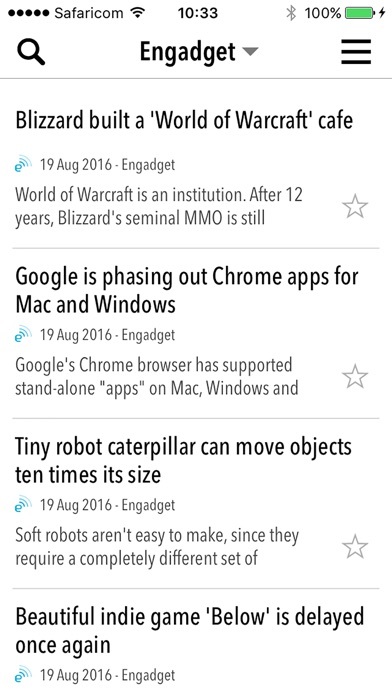 Syncs perfectly with Pocket and Feedly to bring everything to one place! I have this rss feeder for my iMac and love it. I then downloaded it for iPad and love that it syncs for both. But, there is a big bug... when you turn the app in landscape, the app crashes every time. Also, sometimes news links cause the app to crash when the page loads, especially if there is a video. It would be better if the links open the page through Safari, rather than its own page within the app. Other than that. I'm very pleased and will continue to use this excellent rss app. Can't sync, frequent crash, wrong display, what's more? Can I ask my money back? I love the way it syncs with the Mac version and it looks clean on iPhone / iPad / Mac... Definitely streamlining how I find my news. Now on all my devices. Simple, reliable and useful. Responsive developer. First of all, I really like this reader. Use iOS and desktop versions. Since I updated my iOS to 8.0, reader links from sites bring up the podcast app, and not this one. Cannot figure out why. Overall design is quite good and well thought out. I do have issues with the fact that too often the original story is not retrievable and refreshment of stories is inconsistent, it best. Adding new feeds is needlessly complex, or I'm too stupid to figure it out. One thing I'm absolutely certain of, I know how to touch the screen. Yet for some reason when I roux the settings or back button it takes a few tries to hit just the right spot to get the app to react the way you think it should. Now that I've spent six (6!) hours tracking down the exact URL for every feed I follow it works fairly well. I just wish it were easier to use. This app looks good, but it crashes frequently on my iPad (especially with RSS preview set to off). It works fine on my iPhone, a 6+ but there is no native support for the new phones. For me on an iPad Air 2, this app is completely unusable. Very disappointing. I have this app on my Mac Book Pro, my iPhone and iPad and love it on all 3. Easy to use. Some problems sync between devices and problems rolling text on some displays. Needs better integration with selective copy command instead of mailing whole text. Sync takes forever and often doesn’t sync properly to the Mac client. Very let down. It wasn’t updated for iPhone 7plus, no push 3D support and now no support for iPhone X larger display. Please update! I use this app daily. Thank you.